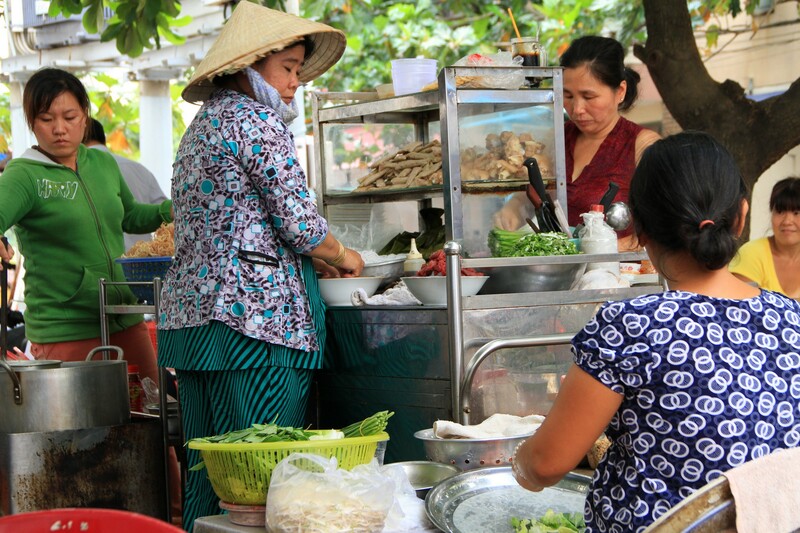 Vietnam is a food lovers paradise. There’s no need for fancy restaurants, although there are plenty of them. Sidewalks are packed with people eating at small tables on chairs suitable for 4 year olds, slurping down noodley concoctions that you may or may not like. 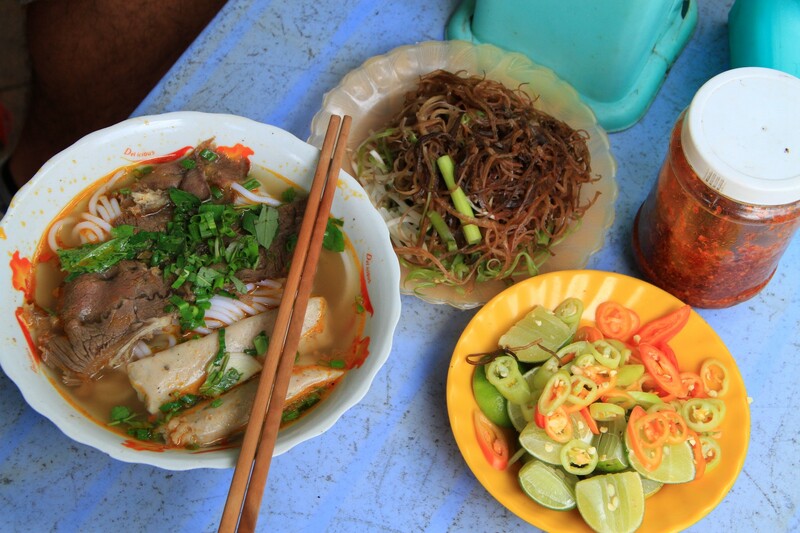 Beef broth and vermicelli noodles, yes! Pork heart and blood broth with noodles, no thank you. The system of picking the fullest place may not work here since people have many interesting palates. 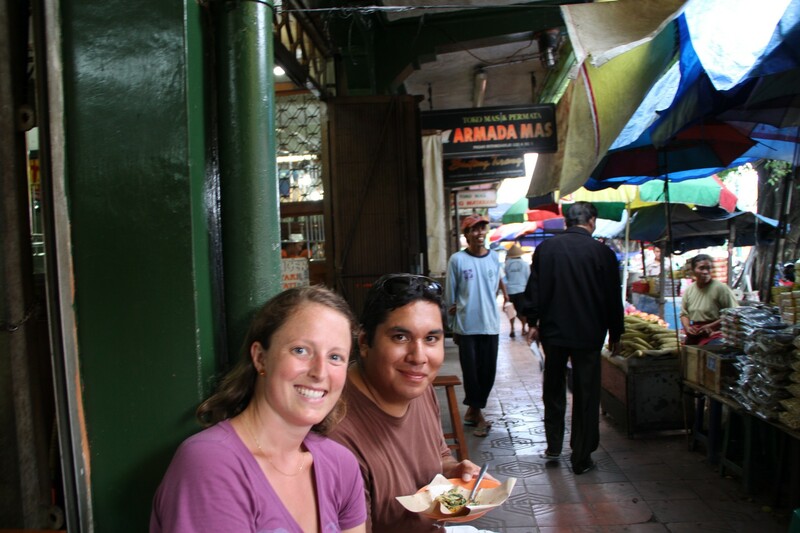 Thanks to Shane and Arielle we had some recommendations already, but exploring new foods is our favorite hobby so we were thrilled to venture out for more. 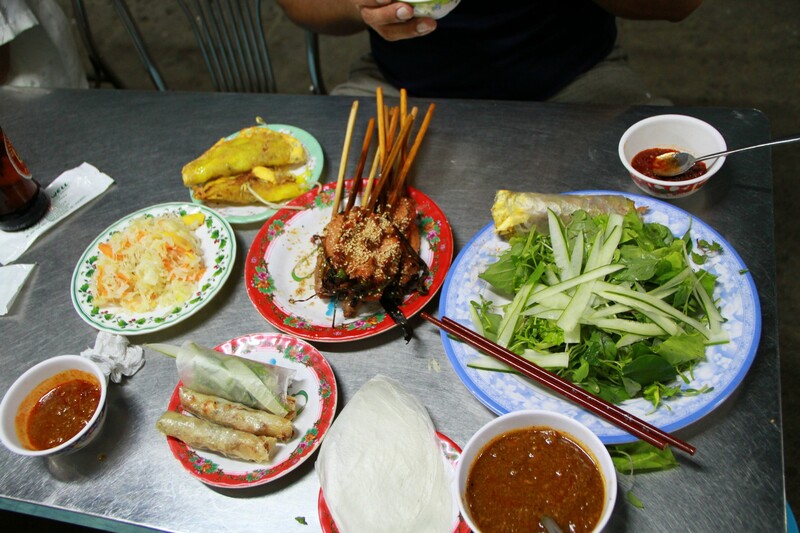 Hoi An gave us an introduction to one meal restaurants. Balewell has been open for 22 years and has served the same exact 4 item menu, that is printed on their napkins, each and every day. You actually don’t order, you sit and are served each item. We had a lesson in proper eating techniques by the sister of the owner who treated Amando like her son, even feeding him. Rice paper, herbs/lettuce/cucumber, chicken or pork off the stick, shredded carrot and radish, finish with spicy peanut sauce. Repeat all of that but add an omelet made with bean sprouts and you’ve now got what sort of resembles a taco. But wait, there’s more! 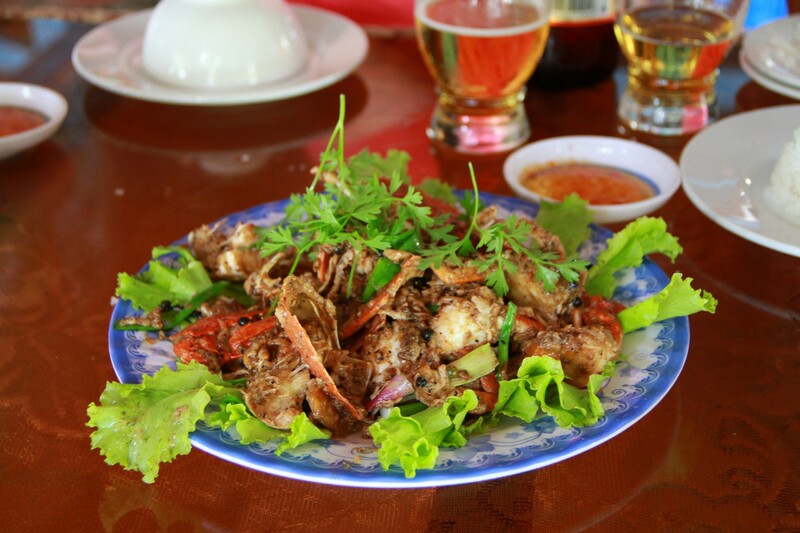 Kampot pepper crab – made with fresh green pepper! One of the best meals of our trip. Leaving Phnom Pehn was tough, it was the best of times bundled up with one big depressing afternoon. Yet off in the distance there was a dream, the dream of Kampot green pepper crab. 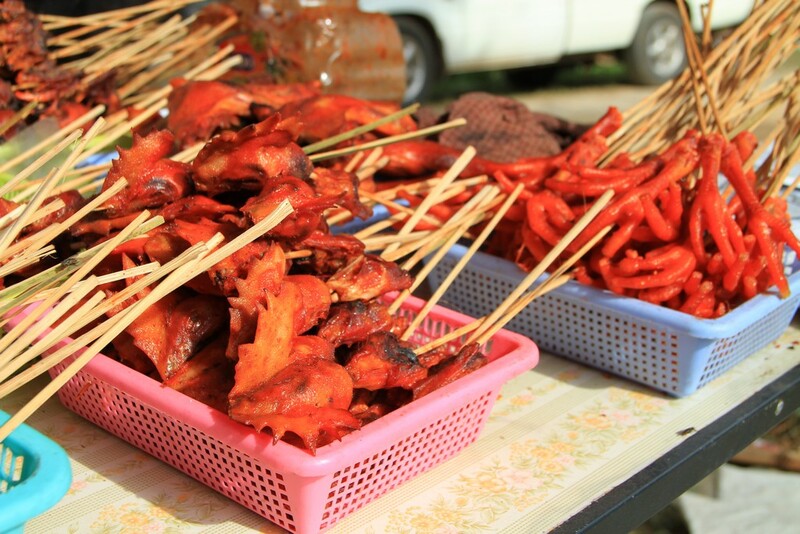 That was the reason for our (Shane, Arielle, A&E) 5 hour journey from Phnom Pehn to Kampot and Kep. The three night stay was all about food; really really good food. The freshly plucked green peppercorns, still on their stem, fried with other unexplainable goodness, and either crab or shrimp, made for an incredible meal. Actually, everything we had, the soups, rice, and seafood, were meals we couldn’t exactly compare with anywhere else on earth. Kep was 100% worth the effort, even if you don’t like to get your hands dirty plucking flesh out of shells. Kampot, also had some good stuff to offer, surprisingly, the best pizza we’ve had in Southeast Asia, and THE BEST ribs in Cambodia (the guy just won a cook off in the capital). The town was sleepy, the streets were empty, had dozens of abandoned homes from bad times past, and the rain barely stopped falling, but E & I would still go back in a heartbeat. Cambodians are just some of the nicest people we’ve met on our trip. But wait, there’s more! Waking up at Inle Lake a month ago, I admired the view as I made my way to Shane and Arielle for breakfast. With a nod I said, “Good morning,” and we start chatting about the previous evening as a hostess sets a cup of coffee in front of me. In Myanmar sugar doesn’t help mask the luke warm cup of dirt water, nor does the room temperature milk help. I take a sip of coffee and my brain does a double take. What? It’s been so long, I let out an, “Awww my goodness,” and Arielle, anticipating this moment, clearly not having taken her eyes off my face exclaims, “Yes! It’s real coffee right! I was waiting for you to take your first sip!” We’re both seriously happy. But wait, there’s more! Foodie Friday: The name works. The concept seems sound. The theme pretty basic. The effort minimal. And, while on extended holiday in foreign countries, documenting the changes seems rather straightforward – point, shoot, write, publish. Except, the last thing either of us want to do on Friday night (morning in America), is a post on food either before or after we go out. But, “write them on Thursday,” people who don’t know me may say. Right. “Doesn’t Erika write them?” you may ask. Like any good engaged couple, we split the task 🙂 Right again. However, there is a very valid and important reason we’ve missed posting gastronomical delights from afar three Fridays in a row. Island hopping has been rough lately. Okay okay, maybe not exactly rough, but the best nights to go out seem to be, as always – Thursday – Saturday night. Which, coincidentally means nothing is happening Sunday. And unfortunately means we have to squeeze all of our beach time Monday – Wednesday. Evenings are also a black hole, or sandy beach or whatever, so yeah……anyways. Back from the brink and on Saturday/Sunday this time is – Ta-Daa! – Foodie Friday. Java, as you would have guessed by the name, has excellent coffee. Traveling is tiring so we need it to stay awake and it varies from place to place. After a couple weeks backpacking we’ve gone from the hustle and bustle of Yogyakarta, by bus to the timber fallen mountain village of Kaliurang, an eight hour train ride to the hip design city of Bandung, and another train ride to Jakarta, we’ve also had a chance to eat the varying cuisine the region offers. But wait, there’s more!